Virgil van Dijk has brought many things to Liverpool since arriving from Southampton just over 10 months ago. Added defensive security is a given. The Dutchman is outstanding in the air, excellent positionally and a fine reader of danger in terms of his overall awareness; those attributes have then set the example for his teammates to follow. There is also leadership as despite not wearing the captain’s armband he is among the most vocal on the field, offering encouragement and constructive criticism in organising the players around him to ensure they maintain absolute concentration throughout. 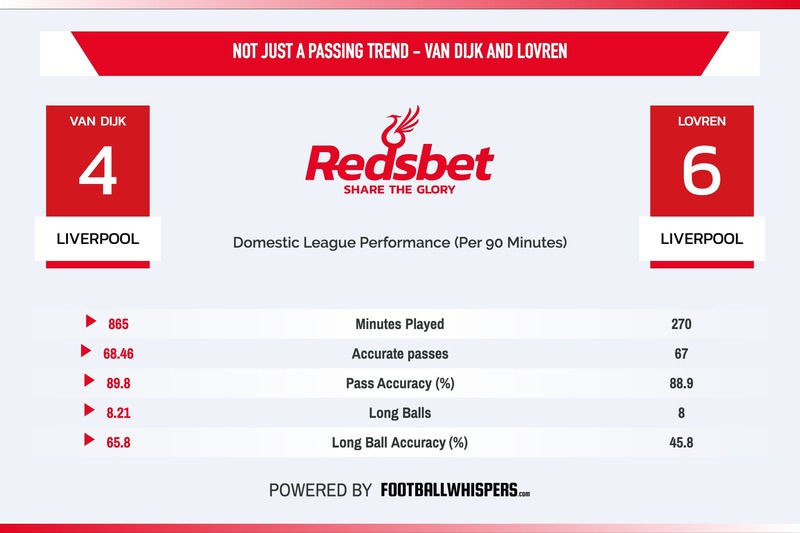 But because of the huge jump in defensive quality from pre-Van Dijk to now, another aspect of his game which gets overlooked is his ability as a passer, and our friends at Football Whispers take a look at the 27-year-old’s role beyond the protection of his own goal. 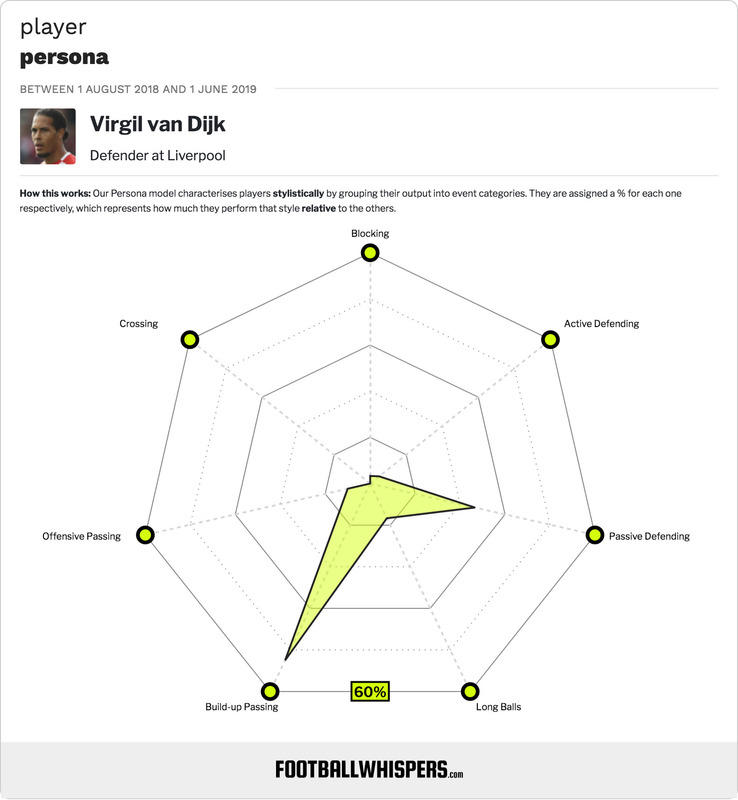 Liverpool always needed a very good defender to, well, defend, which the Dutch international has done with constant excellence, but also the modern game compels at least one of your centre-backs to be proficient in possession. Dejan Lovren, Joel Matip and Ragnar Klavan were content passing side-to-side along the defence or playing short into midfield, but to improve as a team you need a little more. If Henderson or Gini Wijnaldum are having to retreat to the halfway line on every possession to get the ball, turn and then look up, their effectiveness in making an attacking impact is always going to be minimised. Unless it’s Lionel Messi, opposing teams, by and large, want players to receive the ball as deep as possible. The simple laws of football physics mean the further from goal you are, the less chance you have of scoring. But also, the added space and time, allows teams to reorganise and set their defensive blocks more efficiently. To negate this, Jurgen Klopp, of course, encourages passing to be quicker and more direct and that was regularly successful. However, it’s always an approach which can surrender possession more often than retain it, so when it didn’t work Liverpool looked predictable, bereft of ideas and vulnerable as they were giving the ball away too often. Against Cardiff, Van Dijk showed what an asset he can be in an offensive sense, beyond his presence in the opposition penalty area on set pieces. Admittedly, it was a Bluebirds team content to set deep with 10 behind the ball and encourage Liverpool to pass through them, giving Van Dijk and his teammates so much time – as the Reds enjoyed 79.6 per cent possession and 1,004 touches of the ball – but Neil Warnock isn’t the first manager to adopt this approach, and he won’t be the last. Van Dijk regularly stepped forward as an auxiliary midfielder as 88 of his 111 touches were either in the middle third of the field or beyond. That allowed Georginio Wijnaldum and Fabinho to occupy more advanced roles. The latter’s presence was also important as the Brazilian filled in at centre-back when Van Dijk moved forward – a position he regularly played at for Monaco. It’s not quite Total Football (yet) but it’s certainly an interesting development. And while his 102 pass attempts were double the 51 he made in the 1-0 victory over Huddersfield the previous Premier League game, it’s not the first time the Dutchman has adopted such a possession-focused role. The home game against Brighton on August 25 saw him attempt 117, against another side whose game plan was to restrict and frustrate Liverpool’s fluidity. The Seagulls did a much better job than Cardiff, albeit at a stage of the season when Liverpool weren’t properly functioning in an attacking sense, but it’s key to highlight how Van Dijk can do this when the situation is called upon. Unlike Aymeric Laporte, John Stones and Nicolas Otamendi at Manchester City, who every single match have to be that first point of contact in terms of shaping attacks, Van Dijk, as his numbers at Huddersfield (51), Tottenham (28), Napoli (62) and Leicester (65) show he doesn’t have to and can defer responsibility back to his midfielders. That’s reflected by his overall ranking among Premier League centre-backs as he’s sixth for total accurate passes (68.46) and 18th for passes forward (20.18) – numbers, it should be said, are slightly down on last season – but, as he showed against Cardiff, when required Van Dijk can play the role. It all, of course, adds to the growing sense of flexibility within Klopp’s Liverpool as there are an increasing amount of options for the ball to get from A to B and that opposition sides will have to adapt their defensive game plan accordingly.